Words are powerful. 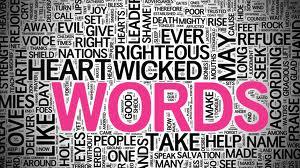 Words that are spoken in your head and words that are spoken out loud are powerful. “You’re hired!” “Will you marry me?” “I love that outfit on you.” “Have you lost weight?” “You are looking so great!” Are just a few phrases that can boost your mood or change your life. Then in 2009 I dressed our two little yorkshire dogs up in baby onsies that said “big brother” and “big sister” to let Robert know we were expecting our first child. Robert said “Why are the dogs wearing baby clothes? !” Haha! Then my words changed our life. “I’m PREGNANT!” Words change things. Ouch! Those seven words are extremely powerful! “I’m tired…and that’s the way I want it.” “I’m busy…and that’s the way I want it.” “I’m fat…and that’s the way I want it.” Ouch! The point the pastor was making was that our words are powerful. So powerful in fact that they can really alter the way our day and even life goes. Words are powerful. Proverbs 18:21 says Death and life are in the power of the tongue, and those who love it will eat its fruits. Isaiah 55:11 says …so is my word that goes out from my mouth: It will not return to me empty, but will accomplish what I desire and achieve the purpose for which I sent it. Therefore, a few years ago, I came to the conclusion that I needed to start saying what God said and not what I felt or thought. I starting speaking scripture out loud. On my 30 minute commute to work I would speak the word of God from a list of scriptures on my piece of paper (don’t worry, I drove carefully!). By the end of that year, that paper could almost disintegrate in my hand. But those words were coming to fruition. In fact, when the Lord asked Robert and I to get out of student loan debt this last year, we made scriptures to speak over our lives. Scriptures that had to do with our money and what God said about it. I placed it in a large plastic bag and stuck it in the shower. I put it on the mirror in the bathroom. And Robert has it in the garage to speak when he works out. …AND THAT’S THE WAY I WANT IT.